A juried collection of six new plays, all around ten minutes long. 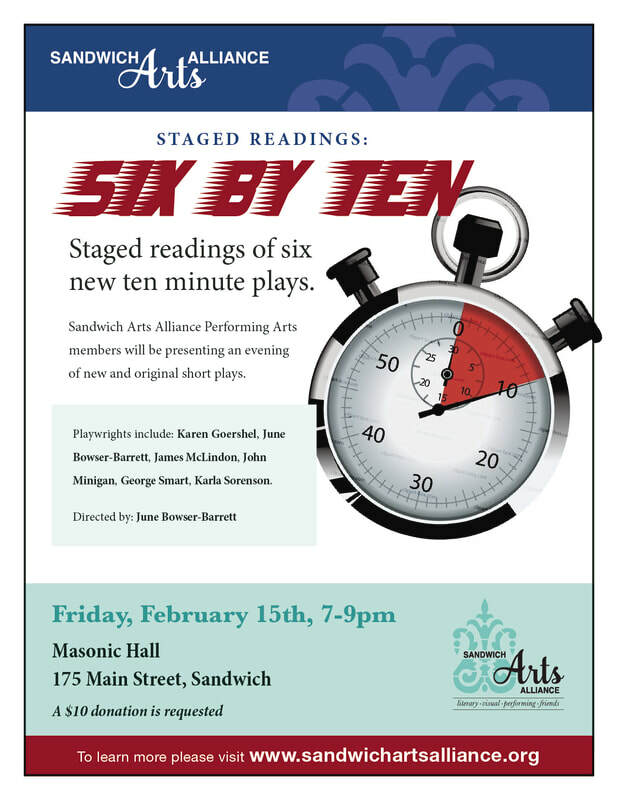 "The oldest town with the newest plays” has been an ongoing goal the Sandwich Art’s Alliance continues to fulfill with six new works by local and area writers and actors in “Six by Ten: Fast and Fun -Staged Readings". The six plays were chosen from many submissions by the Staged Reading Committee of Sandwich Arts Alliance and the overall criteria for choosing these pieces were their entertainment value and “fun factor” for the audience. This is an opportunity to see local talent showcased and to enjoy innovation in playwriting and production as the Arts Alliance continues as an “incubator” or new works. Because there are a variety of topics and themes, there is almost certainly something for everyone. Playwrights include: Karen Goershel, June Bowser-Barrett, James McLindon, John Minigan, George Smart, Karla Sorenson.